One Palestinian baby dead and four people wounded after two homes set on fire in the village of Duma. During the night, a Palestinian Arab child was killed and four other people were wounded as a result of an arson attack on a house in the village of Duma, northeast of Ramallah, the IDF said Friday morning. Video shows the IDF forces evacuating the victims by helicopter for hospital treatment. The suspects - apparently Israeli Jews - allegedly set fire to the homes of two Palestinian families in the village and sprayed graffiti in Hebrew. As a result, the one-and-a-half year-old baby was killed and four other family members were wounded; the injured are currently being treated in Palestinian hospitals. Civil Administration authorities are attempting to arrange the wounded to be transferred to Israeli hospitals for better care. 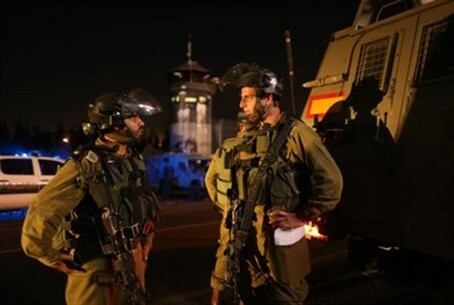 "IDF forces are searching now for the suspects and are doing everything they can to bring them to justice as quickly as possible," the IDF stated. "The IDF views this action as terrorist activity and strongly condemns all terrorist activity in Judea and Samaria, including Jewish terror. The IDF and the security agencies will continue to work towards maintaining order and security in Judea-Samaria." At least part of the IDF's estimation that the suspects were Jews appears to be from the graffiti, which according to Walla! News read "יחי מלך המשיח" ("long live King Messiah") and "revenge"; next to both tags were a Jewish star. Families in the neighborhood told the Palestinian Arab news agency Maan that the suspects had thrown Molotov cocktails at nearby houses, causing the initial blaze. Later Friday morning, the baby was named as Ali Sa'ad Dawabsha. His parents and siblings were injured in the attack. Judea-Samaria Police District Commander Shlomi Michael noted that police are using "all means at its disposal" to find the perpetrators. "All the top commanders of the region are here at the scene," he noted Friday morning. "We will do everything to catch those murderers."